After 5 busy, hectic days in Tokyo, we decided it was time for a break (I know, our life of perpetual vacation is so hard, we needed to take a vacation from it!). So off to the idyllic mountain village of Hakone we went! We hopped on the aptly named RomanceCar train bound for Hakone, and then transferred for an hour long bus to get up into the mountains (easily the prettiest bus ride I have ever taken!). We wound through some very twisty mountain passes, through Japanese Maples, Cherry Blossom trees and bamboo forests, before arriving at our ridiculously charming destination, the Fuji-Hakone Guest House. 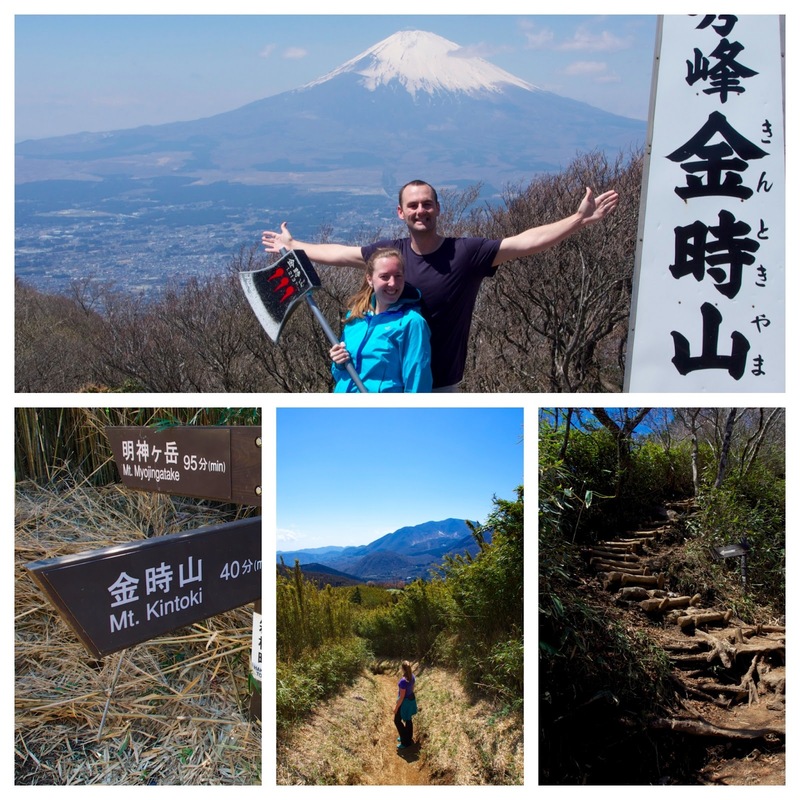 The next day, we awoke to another soak in the onsen, ate a hearty breakfast and took off to find Fujisan (Mt Fuji). After a two hour hike straight up the side of Mt Kintoki (during which we were not sure it would be clear enough to see Fuji once we finally got to the top), we crested the mountain, and there was Fujisan in all her glory! Thankfully, there was a tea house at the top, where we got a tray of tea to enjoy Fujisan (best tea party view ever!!). Then we said our goodbyes and scrambled down the mountain intent on completing the Hakone Circuit, a local tourist activity/trap that has been set up for taking different modes of transit to see the surrounding area. We started by bus (the lamest part for sure) to the cable car station (like a funicular), which took us to the Ropeway (gondola - we felt like we were in Tahoe! ), and finally to the pirate ship. Yes, that's right. Pirate ship. And like any good tourist trap, the offer you the opportunity to upgrade your ticket for the pirate ship to first class for a mere $4! And like any good husband who's wife has been looking forward to the pirate ship all day, he bought us the upgrade (swoon!) and boy was it worth it!! After all the adventuring, we managed to get the last bus back to Hakone station and made our way back to Tokyo after a restful night and adventurous day. As our train sped us back to Tokyo we watched as the sun set over Mount Fuji, a beautiful end to a blissful trip. Unless your really strapped for cash, upgrade your ticket to the Romance Car; you won't regret it! 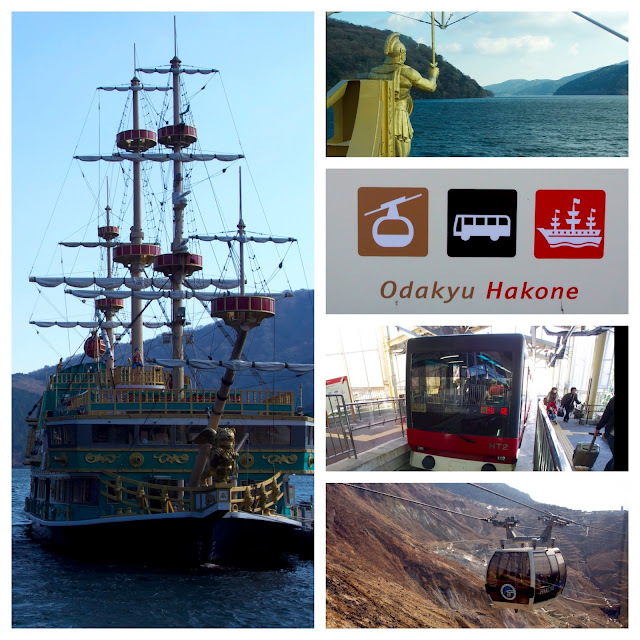 The Hakone Free Pass is a really good deal and makes it really easy to get around Hakone by all the transit options available. We would definitely stay at the Fuji-Hakone Guest House; it is a very traveler friendly Ryokan with wonderfully comfortable Tatami Mat beds. The Owners and the staff are wonderful - they helped us figure out where to go for dinner and also where the best hiking paths were. Also Fuji-Hakone Guest House is one of the few places we researched that have private onsens for reservation; most of the other hot spring baths are either male or female only.